VietNamNet Bridge – Ha Noi will seek funds to relocate hundreds of households living in two communes of Ha Noi’s Chuong My District, the chairman of Ha Noi People’s Committee said. On Monday, chairman of the People’s Committee Nguyen Duc Chung visited Tan Tien and Nam Phuong Tien communes seriously flooded due to heavy rainfall over the past few days. After five days, eight villages in the two communes are still deep in water after a section of the dyke on Bui River broke, as a result of which residents in the area lack clean water and electricity. Three schools in Nam Phuong Tien Commune are closed. 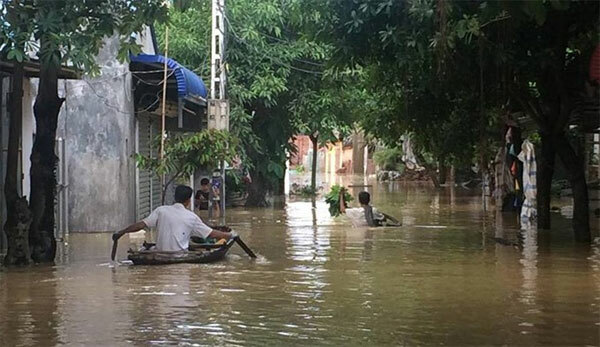 Nguyen Van Manh, chairman of the People’s Committee of Tan Tien Commune, told the Dan Tri online newspaper that heavy rain and floods washed away a section of the dyke, causing serious damage to property. More than 1,000 households of the two communes were isolated by floods and hundreds of hectares of crops, aquatic products and cattle were destroyed or missing, Manh said. Chung asked the Agriculture and Rural Development to use pumps at full capacity to rescue people in isolated areas. With the operation of the pumps, the flooded areas are expected to dry up in 10 days. The Department of Health has also been asked to prepare enough chemicals to spray after the floods to avoid diseases. Local authorities, meanwhile, are continuing to assess and report the losses to the city’s People’s Committee to ensure timely support.